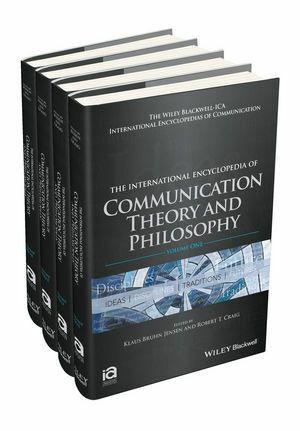 The International Encyclopedia of Communication Theory and Philosophy is the definitive single-source reference work on the subject, with state-of-the-art and in-depth scholarly reflection on key issues from leading international experts. It is available both online and in print. Klaus Bruhn Jensen is Professor and Head of the Center for Communication and Computing at the University of Copenhagen, Denmark. He has published widely in academic books and journals and has presented his work around the world through conferences and invited lectures. He is the editor of several reference works, including A Handbook of Media and Communication Research (2012), now in its second edition, and Area Editor of communication theory and philosophy for The International Encyclopedia of Communication (Wiley Blackwell, 2008). Robert T. Craig is Professor of Communication Emeritus at the University of Colorado Boulder, USA. He is a fellow and former president of the International Communication Association (ICA), and a Distinguished Scholar of the National Communication Association (NCA). Craig has published widely in academic books and journals and has presented his work around the world through conferences and invited lectures. He was Associate Editor of The International Encyclopedia of Communication (Wiley Blackwell, 2008) and a co-editor of The Handbook of Communication History (2012).